Libratone One Style review | What Hi-Fi? Libratone pulled the rug from under its shiny, plastic rivals when it launched its cashmere-clad Beat portable speaker. Six years on, the company is practically a veteran of the portable speaker maker family and models encased in natural fibres have become the exception rather than the rule. The One Style is very much part of the new rule. A minimalist – harsher critics may say, slightly bland – looking design, its standout feature is the thick rubber bumper that surrounds the chassis. This frame also provides a handle with which you can carry the Libratone, as well as hang it up on a suitable chunky hook – kitchen pot rack, we’re looking at you here. You can also remove the rubber frame – Libratone says that this enables you to personalise the unit, but we couldn’t find the frames for sale alone on its online store. Either way, the chance of many users paying to do this strikes us as doubtful – but we probably also said that about fleece-covered speakers back in the day. Removable frame aside – or not aside, as the case may be – the Libratone feels well finished. That bumper lends a sense of bump-based security, and the grille’s mesh is neat. And, like any good Scandinavian, it doesn’t mind a bit of challenging weather, rating at IPX4 for its splash-proof abilities. In response to our gentle digs about its plain appearance, the One Style produces a pretty fancy feature list from its rubberised pocket. The built-in battery, Libratone claims, is good for up to 12 hours of fun, and it will play nicely with Bluetooth devices –plus there is a 3.5mm aux-in. It’s an inclusive sort, too – if you buy another unit you can use the ‘Bluetooth +1’ feature to enable a two-speaker set-up. To do this, download the free app, which is available for iOS and Android. It’s a smartly designed interface, which also lets you adjust sound settings, plus access – and add to favourites – internet radio stations. Nice touches. 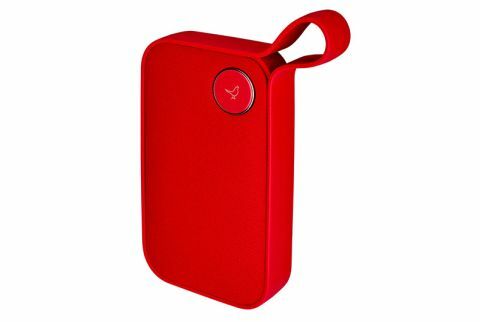 This model is also one of the portable speaker breeds to allow the pairing of two phones. The thinking here is that, say, you and a buddy can take turns in playing tracks. Very democratic. The claimed acoustic performance is also extremely free and easy, offering ‘360° sound’. The speaker system, from which this all-encompassing music is to emanate, counts a passive radiator, a tweeter, and a woofer. Business sorts, as well as cooks with sticky fingers, may appreciate the speakerphone. And, well, that’s your lot. But quite a lot it is, too. So we’ve got solid build quality, plus a spec sheet which brims with special tricks. All we need now is great sound. And the One Style has a good go at this last demand, but it doesn’t quite scale the heights of its rivals. Frustratingly, it’s close, but there is no need for the cigar cutter. We say frustratingly as, to rival the best, this speaker just needs to let itself go. As with its looks, when it comes to sound, the One Style plays safe. Bass is fine. Midrange is fine. Treble is fine. Overall presentation is good. Lower frequencies don’t swamp, mids don’t recede, and treble doesn’t bite. Everything sounds very pleasant. Detail is fair, too, so play Bowie’s Candidate and the speaker lays out the track in an orderly fashion. But while Candidate merits military-like order to its marching beat, as the track progresses it also needs to be let off the sergeant major’s leash. The Libratone, though, steadfastly remains in step, refusing to cast off its inhibitions and really go for it. The result is that you’re left wanting for that extra snap from percussion, a more powerful bass punch, and increased levels of emotion and realism from vocals. The danger here is that we condemn the One Style with slightly above average praise. That’s not our intention. This is a good speaker, and a fine package at that. And we recognise the thought put into extras, such as the app, which is a successful addition. But audio is the issue here. The Libratone is up against more exciting-sounding rivals, and it’s in the emotion stakes that it doesn’t quite reach out and touch you. But for those looking for a controlled performance it remains well worth a listen.